Florida during the second Spanish period when it became a refuge for escaped slaves and American Indian tribes who regularly raided the United States. Carte de la Floride et de la Georgie. 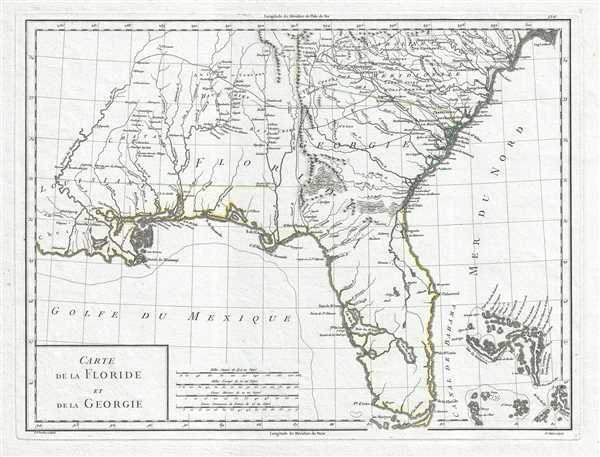 This is a stunning 1798 Pierre François Antoine Tardieu map of Florida and Georgia. The map depicts the region from Louisiana to the Atlantic Ocean and from South Carolina to the Gulf of Mexico. Created during the second era of Spanish rule in Florida, conflict arose between the United States and Spain because Florida became a haven for runaway slaves and a base of operations for Native American attacks on the United States. The first time Spain controlled Florida was from 1513 until 1763. Following the Seven Years' War Spain ceded Florida to Great Britain in exchange for Havana, which the British had captured. After Britain gained control of Florida, nearly the entire Spanish population relocated to Havana, allowing for rapid British colonization. Florida changed hands again because Spain, who indirectly participated in the American Revolutionary War as an ally of France, regained control of the territory following the Treaty of Paris of 1783. As was the case in 1763 with the Spanish residents of Florida, most British residents left the region. A small Spanish presence of a few officers and soldiers reclaimed Florida for Spain, but the region quickly dissolved into near chaos, which instigated the aforementioned conflict between the U.S. and Spain. Spain's response to the American petition was that slave owners were welcome to recapture the runaways themselves, but that the Spanish government would not help. A highly sophisticated and detailed map of Florida, numerous cities and towns are labeled, including St. Augustine, Pensacola, New Orleans, Charleston (Charles Town), Camden, Savannah, and Augusta. Several forts in the region are labeled as well, including Ninety-Six, the site of a major Revolutionary War battle, and Mobile Fort, the future site of Mobile, Alabama. Okefenokee Swamp (Le grand Marais d'Owaquephenogaw) is also illustrated and labeled. This map was engraved by Pierre François Antoine Tardieu and P. J. Valet and published by Edme Mentelle and Pierre-Gilles Chanlaire in 1798. Pierre Francois Antoine Tardieu (1757 - 1822) was a French engraver and mapmaker active in Paris during the latter part of the 18th and early 19th centuries. Pierre was born around 1757 in Paris. Many of his maps are extremely significant and include some of the finest French productions of the period. It is highly likely that Pierre Antoine Francois Tardieu is the successor and possibly the son of Pierre Francois Tardieu as he continued to inscribe many of his maps as P. F. Tardieu well after the latter's death in 1771. There are several other 19th century cartographers also named Tardieu, it is unclear if they are related although such would not be unlikely. Edme Mentelle (October 11, 1730 - April 28, 1816) was a French geographer and historian active in Paris during the late 18th century. Mentelle was born in Paris in 1730. He studied under the historian Jean-Baptiste Louis Crevier at the College of Beauvais before accepting a position as professor of Geology and History at the Ecole Militaire where, incidentally, he tutoring the young Napoleon Bonaparte. He remained in this position until the institution was abolished in 1792. Mentelle later worked as a private tutor and then as a professor of Geography at the Ecole Normale. From 1795 he was a member of the Institut National des Sciences et des Arts, which he helped to found. Mentelle published a number of importantly geographical works including the 1778 Geographie Comparee, the 1779 Atlas Universel, and the 1801 Cours Complet de Cosmographie, de Chronologie, de Geographie et d'Histoire. He is known to have worked with Conrad Malte-Brun, Ambrose Tardieu, Peter Simon Pallas, and other important cartographic figures of his period. Edme Mentelle is frequently erroneously confused with Francois Simon Mentelle, another French Geographer who worked with Cassini on his historic survey of France. Pierre-Gilles Chanlaire (June 21, 1758 - March 8, 1817), also known as Pierre Grégoire Chanlaire, was a French geographer who worked for the Bureau of Topography and Land Registry. He married Angélique-Émilie Vermeil on April 26, 1787 with whom he had two children. John Carter Brown Library C-7602-000. Harvard MAP-LC G3930 1807 .T3. OCLC 76806573.